I’m so excited to share that I made my FIRST homemade ice cream last week with my kids! It was a BIG hit, I’ve already got plans to make another flavor. 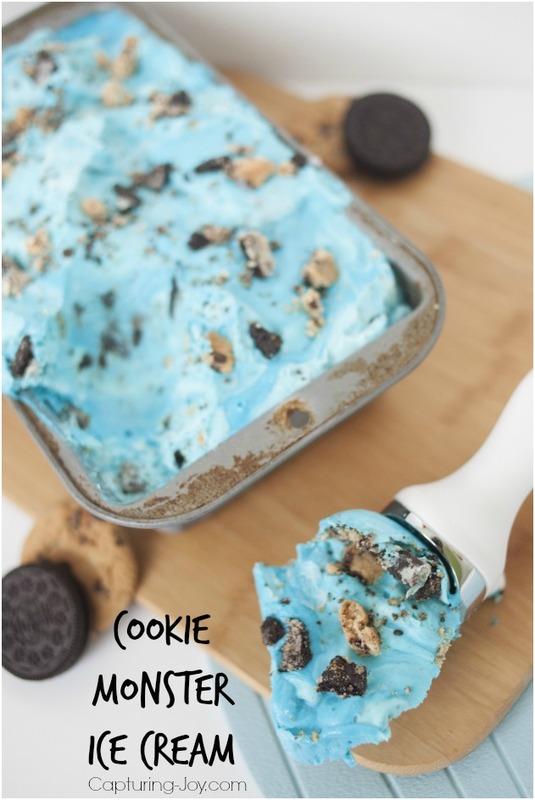 I wanted to do something fun and different, so we died the ice cream BLUE, threw in a bunch of cookies, and called it Cookie Monster Ice Cream. And we made the ice cream without a machine! This ice cream idea all came together when I hosted a little game on my Instagram account . I asked about favorite flavors of ice cream. 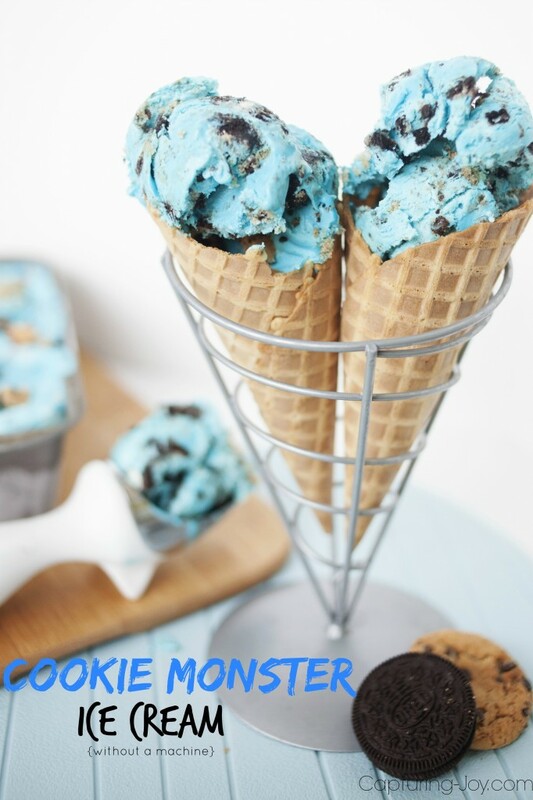 Someone mentioned they’d been to an ice cream shop that sells Cookie Monster Ice Cream, and that it was blue, just like that cute little monster, and I thought it would be so fun to make with my kiddos! They loved helping chop up the cookies and mixing in the dairy. I think it was fun to see how one of their favorite treats was put together. The hardest part is spreading out the jobs enough so that they all feel equally participating. This recipe is SUPER simple, and if you are ok with dying your food every once in a while, the BLUE is pretty fun, but you don’t have to add that part in. This recipe makes a good half gallon, yumminess for several days! Homemade ice cream without a dessert. Easy 3 ingredients plus cookie mix in's! Blue food coloring paste approx 1/4 tsp. Chill a metal bowl and/or beater blades for at least 30 minutes. Beat the heavy whipping cream until stiff peaks form. Slowly add the sweetened condensed milk and beat again. Add in the blue food coloring, as much or as little as possible. Stir in the cookie chunks. 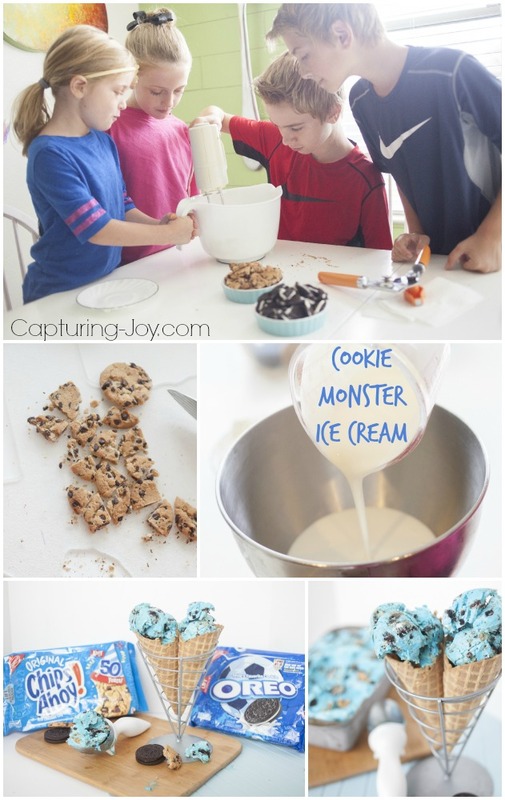 Make some Cookie Monster Ice Cream with your kids, ASAP! 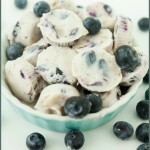 I also have these yummy ice cream recipes on my site.